The French philosophe’s ebullient, incredibly productive years in exile, admirably drawn by the London Financial Times’ former foreign-affairs columnist. 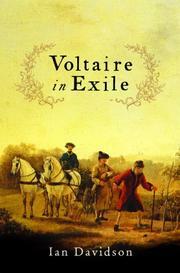 Louis XV was not interested in inviting Voltaire back into the Versailles fold when, in 1753, the writer sought to return from Potsdam. So this leading member of the Enlightenment, ever to be an individualist and outsider, settled in Geneva, where he promptly garnered the Calvinist establishment’s censure. Drawing on what he calls Voltaire’s “meta-autobiography,” a luxurious 15,000 letters collected by his executors from across Europe, Davidson above all traces his subject’s moral development. During these years, the writer crusaded against “superstition, theological repression, Jesuits, monks, fanatical regicides, and the Inquisition in every shape.” He wrote the skewering Candide. He became a landowner and gained a measure of appreciation for the everyday suffering of the toilers in his fields at Ferney. Davidson ably tenders the push-pull of Voltaire’s convictions: he campaigned against miscarriages of justice, particularly as they pertained to Christian fanaticism and the repressive alliance between church and state, but he was anti-Semitic and accepted the need for capital punishment and torture. Often seen as a philosophical forerunner of the French Revolution, in fact he condemned the popular voice (“which is almost always absurd”) and firmly believed in the rights and responsibilities of a quasi-feudal order. Overriding these fissures, however, is Voltaire’s sense of tolerance, his witty brevity in writing for the common man, and his willingness to poke a finger in the eye of powermongers. Davidson imbues the Frenchman’s life with the warmth of his personality, detailing his relationship with Mme. Denis, his love of wine and food, and his ongoing affection for the theater, his gardens, and his multitude of acquaintances.